The Rightline Gear Weatherproof Cargo Net is a bungee-style cargo net for quick, weatherproof protection of your cargo. This cargo net features a Para-Shield tarp that is cut, tear, and abrasion resistant along with tape sealed seams that keep water from seeping through the stitch line. This innovative net attaches the bungee cargo net to the lightweight tarp, eliminating tangling. The tarp easily conforms to your cargo while angled attachment points on the tarp let the cargo net slide and stretch into place when adjusting the tarp. The included attachment hooks can be moved to help adjust the size and tension of the tarp. These hooks attach to your truck's tie down cleats, bed rails, or to the cargo itself. When not in use, the Rightline Gear Weatherproof Cargo Net can fold down and be stored in the included stuff sack, making it simple to throw under your rear seat. Rightline Gear warrants for one (1) year from the date of purchase that its products will be free of material and workmanship defects. Rightline Gear will repair or replace a defective product if it is returned by the consumer to Rightline Gear or to the place of purchase. The product must have been purchased from a Rightline Gear Authorized Reseller. The safe use and long life of this product depends on the consumer’s or user’s good judgement, proper installation, and proper use of the product. The consumer or user acknowledges that Rightline Gear has no control over the attachment of its products to vehicles or the attachment of items to the Rightline Gear products. Accordingly, Rightline Gear cannot assume responsibility for any damage to any property arising out of the use of its products. Installation of the Rightline Gear Weatherproof Cargo Net is simple. Start by loading your truck bed as evenly as possible. Then, pull the tarp over your cargo towards the cab of the truck, tucking the tarp under the bottom of the cargo if desired. Attach the four corner hooks to your truck's corner cleats. 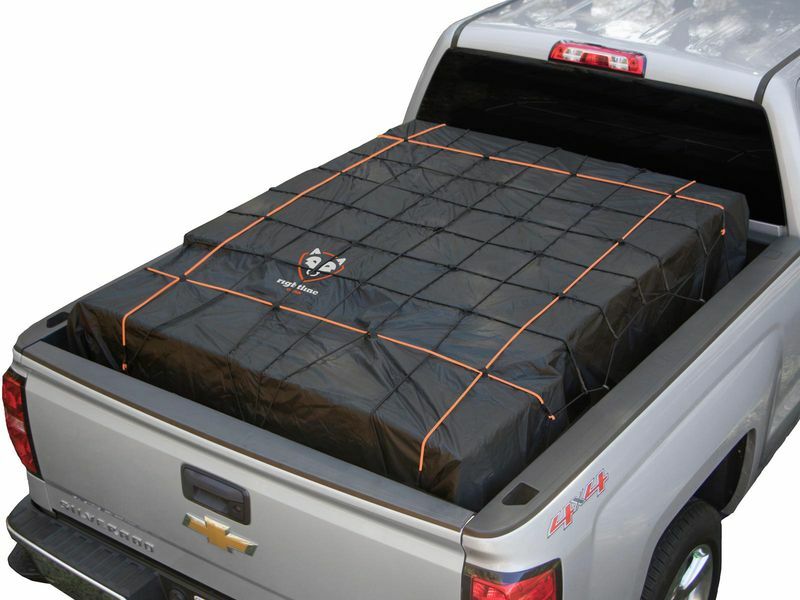 You may add extra hooks if needed to keep the tarp tightly wrapped over your cargo. See the installation instructions for greater detail.